About a year ago, we moved to a new property west of Fort Worth, Texas with the goal of starting anew and creating a haven for me and the dogs to play. It has been quite the adventure. We have installed lighting, fencing, built agility equipment, and started teaching agility classes. In short, we’re creating our own version of heaven. We are still making improvements to the facility, but as things are becoming as I had envisioned, I find more and more time to spend with my dogs. The TV has been left behind and evenings are spent training, throwing the frisbee, or working “around the place”. Don’t get me wrong – all of this has been A LOT of work! I spent 2-3 years just looking for just the right place that was within our budget. Dealing with contractors, building equipment, getting the house in order has not been trivial and it has been much more work than I thought it would be when I started this. However, I am very, very grateful and we are so fortunate that we have been able to move here and create what I have been envisioning for so long. All of my dogs love the open space that we have since leaving the suburbs and they find the local wild life very interesting. The most prominent wildlife are the deer. 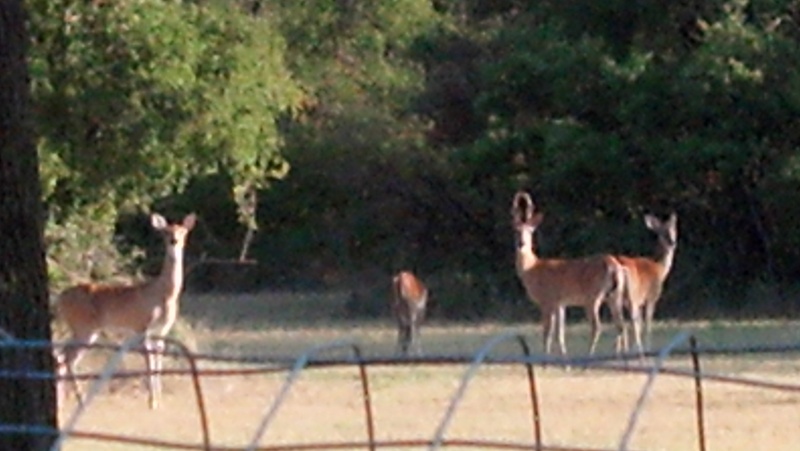 There is a nice sized herd of deer that roam the area and they graze in the field next to the backyard. In the beginning, the dogs barked and ran around when they saw them. A few sessions with the clicker helped them learn to accept them as a part of everyday life out here. Now they still take note of them when they show up, but they generally don’t ever “go nuts” anymore. The deer meanwhile are very interested in the clicker training and that the dogs are getting fed. One in particular starts to walk up to us when we are clicking and I’m sure I could teach her to do something. 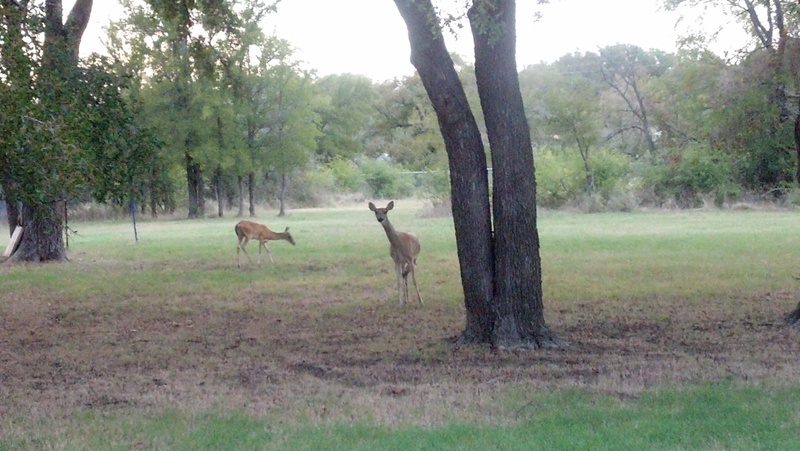 However, I don’t think it’s in the deer’s best interest, so I refrain from doing so. Other wildlife that have been spotted by myself or students include rabbits, possums, raccoons, squirrels, coyotes, roadrunners (which – naturally – go with the coyotes) and skunks (which we all try to avoid). It’s been quite an exciting year and we have a lot to look forward to in the next one.